Houston, Texas – After a contentious runoff that saw some of the worst Republican-on-Republican attacks of the election cycle, retired Navy SEAL Dan Crenshaw is the GOP nominee for the 2nd Congressional District of Texas. Lt. 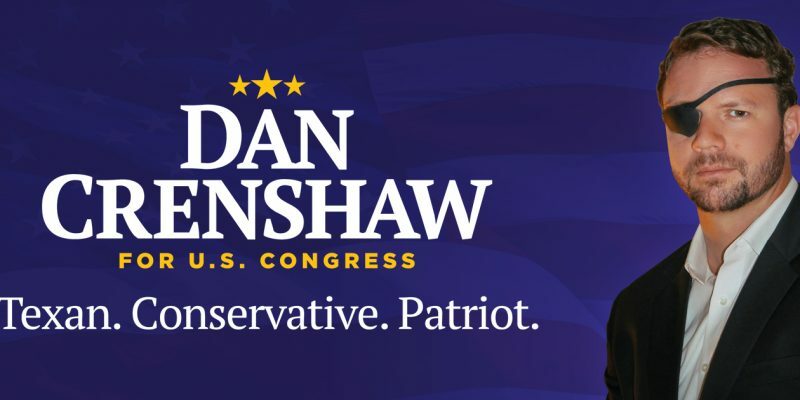 Commander Crenshaw was quickly declared the winner Tuesday evening after early vote and absentee ballots showed him with a 2-to-1 advantage going into election day ballots. With 100% of precincts reporting, Crenshaw has overwhelmingly won the runoff primary 20,322 votes to 8,760 or roughly 70% to 30%. A victory margin of that size is usually reserved for incumbents with a large “war chest” of campaign funds built up over years. The win in a deep-red district all but guarantees Crenshaw the seat of retiring Congressman Ted Poe. The victory rally was kicked off by conservative Houston radio personality Michael Berry before Crenshaw addressed the crowd saying, “Without any single element, if anyone had done any less work… we wouldn’t be here. That was the margin of victory… [in the primary]” He added, “Not this time.” To cheers from a jubilant crowd of supporters. The biggest reason for Dan’s success is his supporters, the most energized and enthusiastic group that we have seen in quite some time. The cause is clear, a decorated war veteran who sacrificed greatly for America on the battlefield yet still returned for two more tours and spoke from the heart of his desire to continue serving his country. Without his inspirational nature, he wouldn’t have narrowly beat the nation’s biggest spender-per-vote in the Primary and we would have seen an entirely different runoff.